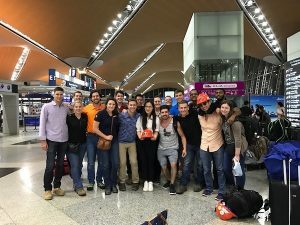 The GLCM team woke up early to finish packing our belongings before beginning our last day in Kuala Lumpur. The day would consist of visiting two Turner International sites in the city before heading to the airport for a long journey home. Up first was the 40 floor multi-use, Etiqa Tower. The tower will feature offices, retail, a food court and more. 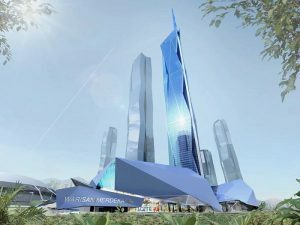 The building will hold three sustainability certifications – the Malaysian Green Building Index, the GreenRE, and the Multimedia super corridor Malaysia. Another key sustainable feature while be a green wall facade that will become that largest of its kind ever in Malaysia. Peter Duffy, the project manager for Turner International, graciously gave a presentation on their role as the program manager before walking us around the site. Peter emphasized how a large part of their success was because they were able to be involved with the project from its conception. A key benefit of this was that Turner International directly hired all the subcontractors and has made it easier to manage them as they reported directly to them. This project differed from our other KL sites, as all the contractors were Malaysian. A key construction method used in this project was the Peri Skydeck System. This system is used in place of a traditional scaffolding and formwork system that was able to significantly reduce the cycle time per floor by about 1 week. This system also allows for a much more manageable and cleaner site, predominately due to the need for less manpower for installation. Retractable loading decks was another method used to deliver craned material quickly to the necessary floors above. The loading decks can line up, but also retract, so that lower levels do not block those above it. 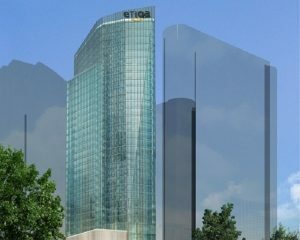 Currently the Etiqa Tower is contracted to a BIM requirement of 500. This number depicted the scale of detail level required. 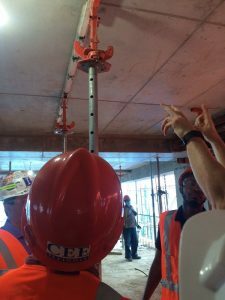 500 is the highest category detailing virtually every single nut and bolt in the building, if completed to this standard it will be the first model of its level in Malaysia to date. The Etiqa Project planning began in July of 2013 and is scheduled to be completed in July of 2018. 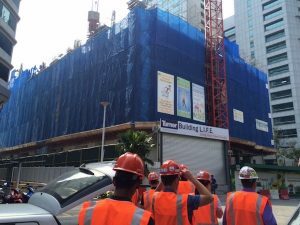 For our final visit we were fortunate enough to have the opportunity to visit the Warisan Merdeka Development site, where the highly anticipated Merdeka PNB 118 Tower will sit. 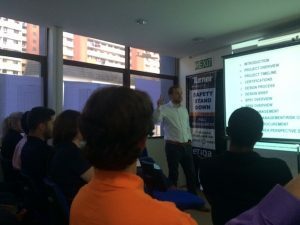 Matt Hennessy, a pre-construction manager for Turner International, presented on their program management to-date. The head construction contractor, Gary, also sat in on the presentation in order to provide another perspective for the group. The Merdeka PNB 118 Tower is 118 floors high at a gross foot area of 292,000 meters squared. 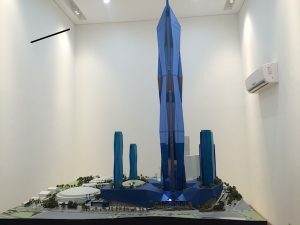 The tower will be the 6th tallest building in the world when completed, yet the tallest tower in all of Southeast Asia. The tower itself will consist of office space, a luxury hotel, sky lobby observation decks, and other amenities. To service the needs of the tower, 87 elevators will be in-service where several of them will be double-decker. Aside from the tower, the 19-acre development also features two 66 story towers, one 54 story tower, a mall, two parking structures, significant infrastructure improvements, and more. A unique feature of the development was the extremely small tolerance of 15mm between the projects diaphragm wall and the surrounding rail activity. To minimize risk, a top-down excavation was implemented for the outer perimeter of the site. The rest of the site took a bottom-up approach as it is the more cost-effective and time-saving solution. Unfortunately, we weren’t able to walk the site due to pressurized gas line work that was taking place that day. However, Matt took us to the next best place to view the site which was the neighboring stadium next door that overlooked it. And with that, it’s sad to say that our travels to Singapore and Malaysia have reached their ending. 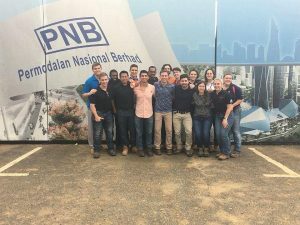 We want to thank each one of our hosts for the opportunity to visit their jobsites and learn so many invaluable construction management lessons. We also want to thank our company sponsors, as well as all of you who joined us on our journey by following along here on our blogs! Our next trip will be this March, when we will take on Los Angeles! Until then, the global leaders are signing out!